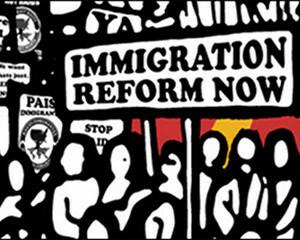 Advice Box: What is Comprehensive Immigration Reform? News and events from the African community in Illinois this month. Top news stories from the African continent. How to get employment advice from the UAO. Africans in Chicago interview with Fatimata Traore, President of Illinois Association of Hair braiders. Music from Chicago-based duo Survivors, made up of Johnny T from Rwanda and Jeanri from Haiti. If you would like to contribute news, events, issues, interviews or music to our podcast, email us: podcasts@uniteafricans.org or call: (312) 949 9980 between 9am-5pm, Mon-Fri.
Click the link below to see the full details of news, events and music featured on the podcast. You can also log on live to Legend Talk Radio online to listen. Their music has often been associated with the Tuareg rebelion. In fact, they fought during many years in the southern Sahara for the rights of the Tuareg people. But now, the Malian band, who was born in 1982 in exile, in Algeria to be more specific, has changed the machine gun into the guitar and harmonic voices. Their musical creations call for political awakening and consciousness while dealing with exile issues, repression, and political claims. They mix with verve traditional and modern tones, traditional tones which are symbolized by the drums and modern tones which are symbolized by the electric guitar. Tinariwen toured Chicago recently to celebrate the release of their new album. United African Organization’s Cheikh Diop was there to interview them in French. The translation of this interview is available below. Click ‘Continue Reading’ to read the English transcript. Information about the UAO’s free ESL (English as a Second Language) classes. Feature on Liberia and Sierra Leone: Interviews with authors Jonny Steinberg from South Africa (Little Liberia) and Bobby Gboyor from Sierra Leone (Clouds of a Ghoulish War). Full versions of the interviews will be available soon. Music from the new album Tassili by Malian band Tinariwen, who played in Chicago recently. Look out for next week’s Special Holiday Edition of African Voices Podcast, featuring an interview with Tinariwen and more of their music. You can now watch the UAO’s interview with Rachel Wassira of the Tanzanian Community Association of the Midwest. UAO Executive Director Alie Kabba interviewed Wassira on CANTV last night. They spoke about the Tanzanian independence struggle, Julius Nyere, and Tanzanians in the United States. The Tanzanian Community Association is hosting a celebration in Chicago on Saturday to mark Tanzania’s 50th Anniversary of Independence. Scroll down below the video to see details of the celebration. There will be Tanzanian food, music, dance and a fashion-show. For more information or to get tickets, Call (773) 474-4225, (630) 303-1478, (773) 593-7881 or (773) 507-7277.